Leading property services company Work Services is delighted to announce that it has won a UK-wide term contract to provide furniture repair, disposal, and movement and churn services across the entire Barclays 1800 branch network. Working in partnership with Atkins, Work Services is now operating a delivery network that provides a consistent and high quality office furniture service across the country and replaces the complex configuration of independent regional service providers. By rationalising under one organisation, Barclays and Atkins will reap the benefits of a single interface, faster response times, efficiencies of scale and a more customer-focused office furniture service. 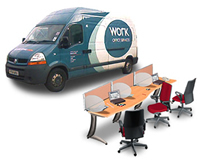 Work Services is part of the Work Inc Group a commercial interiors and property services company, employing around 350 people, with forecast 2008 annual revenues of £31m. The groups’ 120-strong client list includes DLA Piper, DTZ, Bruntwood, Unilever, Wolseley, HBOS, GE Money and InBev. The principal support centre is located at Thorpe Business Park, Leeds, with further offices in London, North West, Midlands, North East, a national design centre in Harewood, Leeds, and warehousing and storage facilities across the UK. This press release was distributed by ResponseSource Press Release Wire on behalf of Web Certain in the following categories: Business & Finance, for more information visit https://pressreleasewire.responsesource.com/about.